Often the most beloved part of a house of worship is the stained glass windows that adorn the sanctuary. So when cracks appear or re-leading becomes necessary, religious and lay leadership find themselves in the position of selecting a partner in the restoration of stained glass windows – often the only time in their lives they’ll do so. This page is here to explain exactly how to write an RFP for stained glass restoration. While the intricacies of restoration may vary on a case-by-case basis, here are seven basic tenets that underlie the RFP process. Use these as a guide to be most effective when putting out a request for proposal. 1. 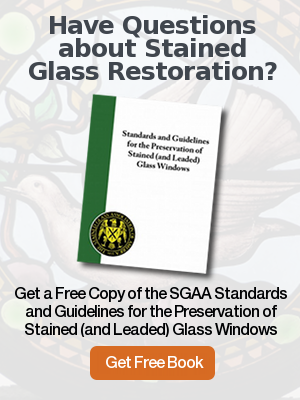 Seek out studios that have the gravitas that comes with being fully accredited members of the SGAA, the primary industry association for stained glass restoration. There are several levels of membership in SGAA corresponding to the depth of experience of a potential stained glass vendor. There is a huge difference between a stained glass restoration firm that has done projects exceeding 250 square feet, and those that haven’t. Likewise, the longevity of the firm separates the heavyweights from the others. Match the sophistication and scope of your project to the vendors’ background and experience. If your project includes windows of historic significance, such as by Louis Comfort Tiffany, make sure that your bidders have a track record with the artist or artists of similar style and windows of similar value. If the damage to the windows is severe, have they recreated glass and wood frames true to originals like yours? 2. Ensure that your proposal elicits the precise restoration method and observations derived from an on-site inspection. Ask whether or not protective glazing with proper venting is required, the type of equipment that would be used and how structural elements would be repaired, to develop an “apples-to-apples” comparison. Don’t simply describe the condition of the windows or panels but also require prospective bidders to employ whatever means necessary (scaffolding, ladders, et cetera) to inspect the stained glass windows and provide a scope of work and cost breakdown that ties directly to the work. 3. Meet with potential vendors in their stained glass studio, using that opportunity to observe work habits and get a feel for their communication style. Any serious stained glass restoration firm is happy to welcome you for a visit to their studios. There you can meet many of the craftspeople who will realize your project. As experts in their field, they should take pride in the work they are doing and show you their skills in action on current projects. The quality of communication and the actual relationship is as crucial as technical expertise to lay the foundation for a project where cost overruns and missed milestones don’t happen. 4. Check references of prior church or synagogue jobs. A studio with a long track record of stained glass restoration should have many satisfied customers. Ask to speak with references directly. Besides assessing the bidder’s reputation, this provides the opportunity to gain pointers on the elements of project administration, costing or implementation that were trickiest and would particularly differentiate vendors. Seek references with similar site conditions, quality of stained glass, historic significance, size, age, etc., so your questions are answered in the context of your project’s scope. The best candidate for stained glass restoration is rarely the lowest cost bidder. Seek insight into what’s missing from low-cost bids to ensure that your stained glass, facility, congregation and finances are protected. A red flag here might be to ensure that the work will be done at the studio’s own facilities vs. on-site at yours. It is impossible to protect stained glass workers, the environment, and congregants and staff if stained glass restoration work will be conducted on site. 5. Ask bidders for the crucial documents, including Lead Safety Certification, Insurance and Warranty, to indicate they are qualified to mitigate the risks of lead exposure, financial risk, risk of theft, and so forth. Additionally, every aspect of restoration and repair should be warrantied. Stained glass restoration is a niche industry with very specific qualifications. If a potential vendor does not possess lead safety certification or plans to subcontract any aspect of the work (including installation or removal of windows), this is a red flag. They should be able to get the job done from end to end. A good example of the attention to detail required is with insurance. Top tier studios protect their clients as well as themselves with end-to-end insurance coverage. An oft-overlooked but important insurance for stained glass restoration is Bailee’s Customers Insurance, which protects your stained glass while it is in the possession of the studio, in transit and at their place of business. 6. Ask for the specific work history and skill level of each person who is being proposed for the team. The stained glass studio should be able to provide a detailed roster of the team that will be assigned to your project, their experience and role. This will be more detailed for the higher-order skills. Most should be full-time employees of the studio and not sub-contractors with years of experience (exceptions may be made for artists, apprentices, freight handlers, etc.). 7. Don’t allow a paid consultant to bid on restoration work. This is a conflict of interest. However, if your church or synagogue invites a studio to write the specifications for stained glass restoration without compensating for this task – for example, if the expertise to write the RFP does not exist internally — then the stained glass studio that does so should be allowed and encouraged to bid on the work and perform it. This valuable service demonstrates the commitment of the studio to quality work, beginning with accurate specifications for estimating stained glass restoration. 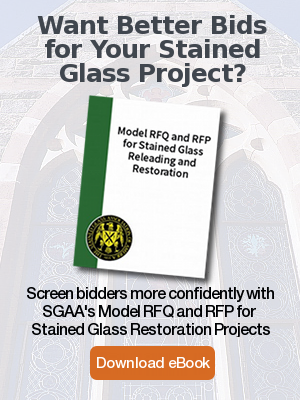 You can download model documents of Stained Glass Restoration Request for Qualifications and Stained Glass Restoration Request for Proposal, published by the Stained Glass Association of America at this link.